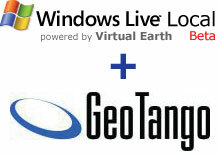 As usual, Adena gets to the bottom of Microsoft buying GeoTango. In her article, she talked to Stephen Lawler who is the Manager for Windows Live Local about what this acquisition means to Live Local. Once you fight though all the buzz words and marketing speak you begin to see what the future of Live Local might be and how Microsoft might use the technology in all their products. As one astute comments pointed out, how the blogosphere has missed such an important announcement as this is baffling. Nothing from Robert Scoble or Chandu Thota shows that even Microsoft has missed this. Kudos to Adena for getting the story!